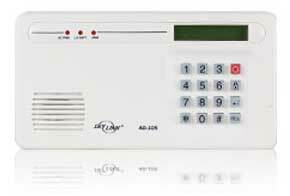 Wireless Alarm System SC-Series - No Contract. No Monthly Fees. The Skylink Wireless Alarm System provides Complete Control of your home, business or desired premises. Skylink offers three different starter kits to choose from. The Systems are expandable with up to 30 Accessories, enabling the owner to customize in accordance to their personal needs. The simple DIY setup allows you to easily install the system yourself, without the expense of professional assistance. We'll never make you sign a long term contract or pay monthly fees to protect your home! You're in Complete Control. Unlike other traditional security companies, we offer a great value for a reasonable price. The purchase of the Skylink Wireless Alarm System saves you the installation fee and the monthly service charges. *Based on average monthly fees of $40. We'll let you know that everything is communicating. Our Control Panel and sensors come pre-programmed. As you install your sensors you can test them in chime mode and the chime will confirm that the senor has successfully transmitted a signal to the Control Panel. All our sensors come with mounting material to mount the sensors with the screws or with the adhesive strips. The adhesive strips are the best way to mount your sensors quickly and mess-free. The holding power is amazing. Your sensor's batteries stay fully charged with our battery strip. Simply pull the tabs to power up the sensors. Insert the Alkaline Battery into the Control Panel and the Dialer, and you're ready to start. Plug & Play: All your sensors arrive pre-programmed with batteries, adhesive strips and mounting accessories. The Control Panel can control up to 30 sensors. If any of these sensors are triggered when the system is armed, the system will sound the siren and will send a wireless signal to the dialer to call out for help. The Voice Dialer allows you to record an emergency voice of up to 40-seconds and to program up to 9 emegency contact phone numbers. Once the alarm is triggered, the Emergency Dialer will automatically dial the 9 contacts and play the pre-recorded voice. 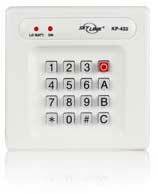 Install an additional Keypad Control at the back door or at additional entrances to easily arm/disarm your security alarm system. 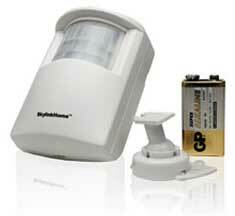 The Motion Sensor increases the security by detecting movement inside or outside your home. Using a ball-head joint, simply mount the sensor at a desired location and it will sense movement of up to 40-feet away in a 110 degree range. Protects doors, window and other entrances. Comes with one set of magnetic contacts. You may install additional contacts as needed. 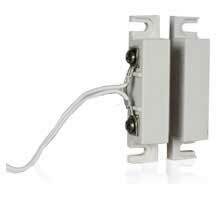 The Magnetic Switch works in conjunction with a WT-433E Door/Window Sensor. 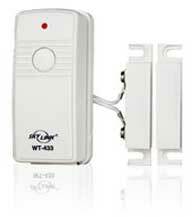 It can be used as a replacement part or used as an add-on to your existing WT-433E Door/Window Sensor to monitor 2 windows or doors. The Temperature Sensor is designed to monitor the temperature of a specific area whether it is indoor or outdoor. If the actual temperature exceeds the preset limit range, the sensor will trigger the alarm. 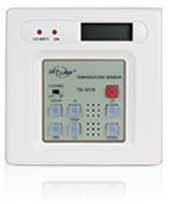 The Audio Alarm Sensor detects alarm sound from the siren of your existing alarm (i.e. smoke detector). 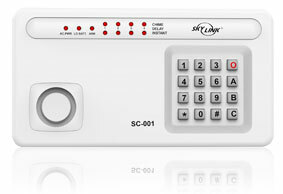 Once the siren goes off, the Audio Sensor will activate and trigger the Skylink Security System and Dialer. The device is designed to recognize only the siren and will not pick up any background noise. Place along the basement walls, near the water heater, behind the washing machine, under the toilet, or any other place where water may damage your home. Once triggered, the Flood Sensor will send a signal to the Control Panel when water is detected, which will trigger the alarm. This 4-button device hangs on your keychain and can arm/disarm your security system with the press of a single button. Use your panic button in case of Emergency. Carry this little panic remote transmitter with you while relaxing outside infront of your house or while gardening in the backyard. Press the button if you feel threatened or if there's a medical emergency and your Skylink Alarm System and Emergency Dialer will instantly respond. Make sure your loved ones can contact you in the case of an Emergency. Ideal for senior citizens living alone. The Wrist Remote Panic Button will trigger the auto-dialer and call the pre-programmed telephone numbers once the button has been pressed.